EAP (Extensible Authentication Protocol) - EAP is an extension to the Point-to-Point Protocol (PPP) was developed in response to an increasing demand to provide an industry-standard architecture for support of additional authentication methods within PPP. EAP is an authentication framework, not a specific authentication mechanism that is typically used on wireless networks. It provides some common functions and negotiation of authentication methods, called EAP methods. There are roughly 40 different methods defined. Commonly used methods capable of operating in wireless networks include EAP-TLS, EAP-SIM, EAP-AKA, PEAP, LEAP and EAP-TTLS. When EAP is invoked by an 802.1X enabled Network Access Server (NAS) device such as an 802.11 Wireless Access Point, modern EAP methods can provide a secure authentication mechanism and negotiate a secure Pair-wise Master Key (PMK) between the client and NAS. The PMK can then be used for the wireless encryption session which uses TKIP or CCMP (based on AES) encryption. Strong EAP types such as those based on certificates offer better security against brute-force or dictionary attacks and password guessing than password-based authentication protocols, such as CHAP or MS-CHAP. Echo - Occurs when portions of a transmission are repeated. Echoes can occur during many locations along the route. Splices and improper termination in the network can cause a transmission packet to reflect back to the source, which causes the sound of an echo. To correct for echo, network technicians can introduce an echo canceller to the network design. This will cancel out the energy being reflected. EDI (Electronic Data Interchange) - EDI is the computer-to-computer exchange of business information using a public standard. EDI is a central part of e-commerce, because it enables companies to exchange business information electronically much faster, cheaper and more accurately than is possible using paper-based systems. The parties who exchange EDI transmissions are referred to as trading partners. EIGRP (Enhanced Interior Gateway Routing Protocol) - EIGRP is a Cisco proprietary distance vector routing protocol, with optimizations to minimize both the routing instability incurred after topology changes, as well as the use of bandwidth and processing power in the router. For EIGRP, separate routing tables are maintained for IP, IPX and AppleTalk protocols. However, routing update information is still forwarded with a single protocol. EISA (Extended Industry Standard Architecture) - EISA is a bus standard for IBM compatible computers. It was announced in late 1988 by PC clone vendors as a counter to IBM's use of its proprietary MicroChannel Architecture (MCA) in its PS/2 series. EISA extends the ISA bus architecture to 32 bits and allows more than one CPU to share the bus. The bus mastering support is also enhanced to provide access to 4 GB of memory. Unlike MCA, EISA can accept older XT and ISA boards — the lines and slots for EISA are a superset of ISA. Although somewhat inferior to MCA, EISA was much favoured by manufacturers due to the proprietary nature of MCA, and even IBM produced some machines supporting it. It was somewhat expensive to implement (though not as much as MCA), so it never became particularly popular in desktop PCs. However, it was reasonably successful in the server market, as it was better suited to bandwidth-intensive tasks (such as disk access and networking). 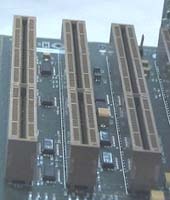 Most EISA cards produced were either SCSI or network cards. EISA is not commonly seen anymore.